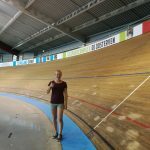 Presenting ‘Comparison of biomechanical data of a sprint cyclist in the velodrome and the laboratory’. I am a final year sports biomechanics PhD student and ISEA granted me a £500 student engagement award which helped me to travel to Auckland, New Zealand to present at the International Society of Biomechanics in Sports Conference 2018. I was shortlisted for the New Investigator Award and as such had to present in the main lecture hall to a panel of judges. This was a great experience for me to showcase my research and get feedback from other sports biomechanics researchers. There were some very thought provoking and engaging keynote presentations, in particular Sophia Nymphius from Edith Cowan University who presented ‘re-evaluating what the know about female athletes in biomechanics research: across the continuum from capacity to skill.’ The main idea of her talk was that most of the mechanical gender differences found by numerous studies can be traced back to strength or training experience, and in papers where these have been normalised or matched, often there are no mechanical differences between men and women. 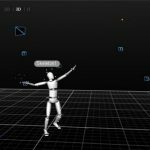 There were some interesting presentations on Artificial Intelligence and machine learning and their applications to biomechanics. These methods have the potential to allow collection of more and detailed biomechanical data in-situ and in a much larger capture volume than with traditional marker-based systems. This is particularly relevant to my research as we try to move to more field-based measurement of biomechanical variables, and my presentation highlighted that we need to measure biomechanics of sporting movement in a representative environment. While attending the conference I was able me to network with biomechanics researchers from around the world. 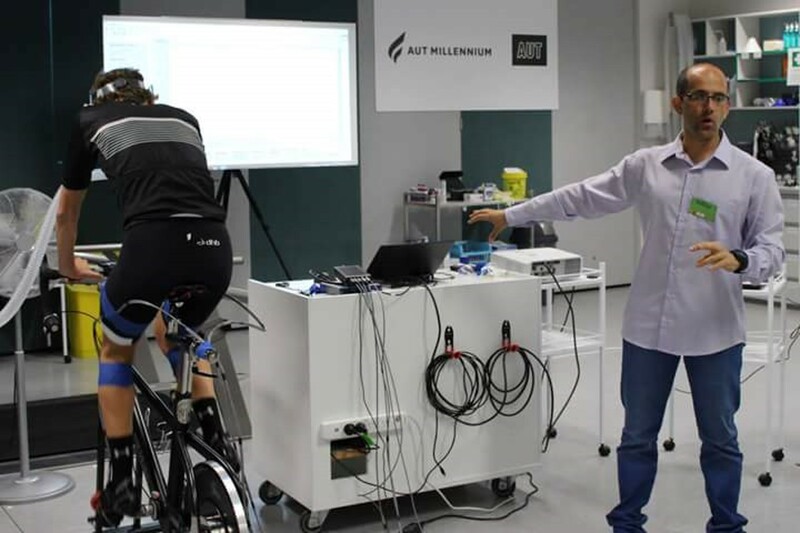 We had a visit to AUT Millennium which is a high-performance centre and where sports science research and applied support to the NZ team is undertaken. We had some practical demonstrations of the equipment at the centre. I would like to thank the ISEA for awarding me this grant, as the experience was very valuable in my progression as a researcher and to my PhD. 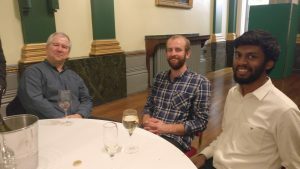 The funding provided by the ISEA allowed me to attend the 2018 International Auxetics Conference in Sheffield, to present a poster as part of the AuxetNet Young Reaserchers Forum. The funding was used to cover my registration fee for the event, and without it it would not have been possible for me to attend. My poster presentation was on the “use of auxetic foams for low bulk, high mobility, protective equipment for mountain biking”, and was a summary of the work carried out for my Undergraduate Dissertation at Sheffield Hallam in Sport Technology. 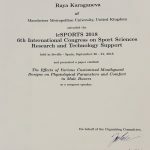 Presenting this work allowed me to receive feedback from a broad range of other delegates from around the world, feedback that shall be invaluable as I continue my research and studies in my Sports Engineering masters degree. The conference also opened my eyes to just how broad a subject area auxetics is. Having only worked with auxetic foams to date, it was extremely interesting to gain some knowledge of other auxetic structures, and begin to think about how they may also be applicable to sports equipment design, in particular sports PPE. 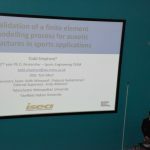 There were a number of presentations made on the possible use of auxetic materials in sports equipment, proving to me that this is very much an area for continued research as a sports engineer. The breaks throughout the day, and evening meals, gave the perfect opportunity to discuss with other researchers about their work, and think about how it could be useful for my future studies, and to discuss my findings to potentially help them. On the penultimate night we were treated to a gala dinner in the cutlers hall in Sheffield city centre. 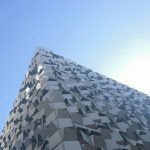 Having lived in Sheffield for the past 4 years now it was interesting to experience a building that I have never had the opportunity to visit properly in my time here. The dinner, and pub later, provided the opportunity to get to know the other delegates on a more personal level, rather than purely academic, and as a result strengthen my relationship with these contacts who I am sure I shall have contact with when conducting future work. I would like to thank the ISEA for the Student Engagement award, as it provided me with this experience that has set me up well for my continued study in Sports Engineering. It has also prepared me well for future conferences that I shall be required to present at, as I progress through my intended career of research and development of sport protective equipment. 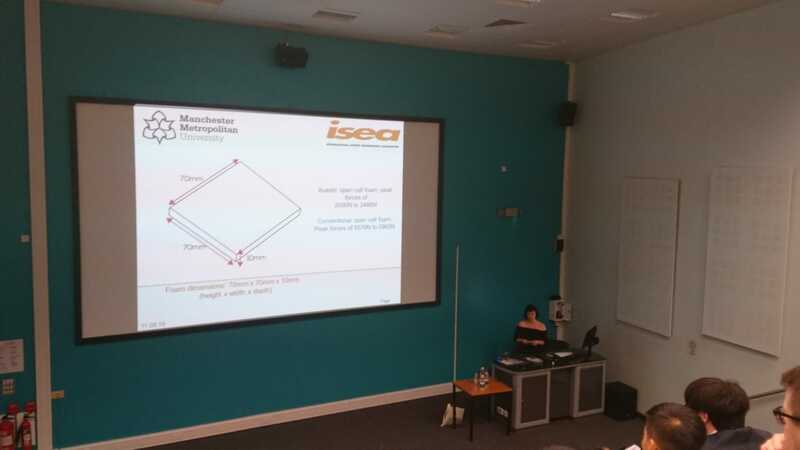 The ISEA student engagement award enabled me to attend the 9th International Conference and 14th Workshop on Auxetics and Related System with ‘Negative’ Characteristics held at Sheffield Hallam University from September 10th-13th 2018 for an oral presentation. I presented the work carried out between the Materials and Engineering Research Institute and the Centre for Sports Engineering Research at Sheffield Hallam University supervised by Andy Alderson and Olly Duncan during an international placement from Loyola ICAM College of Engineering and Technology, Chennai, India. The grant covered my travel to the conference and other expenses. Delegates from all around the world came to attend this conference. I had a great opportunity to interact with professors and students from various other disciplines in the field of science and engineering. It made me see how a simple concept can be used in so many different fields. Even though I was nervous about the oral presentation as it was my first conference, the delegates easily understood what I was trying to convey. I was also able to answer their questions and I got a few more points for future work. I received valuable feedback from everyone about the presentation too. This has encouraged me to follow a career in research. I am now looking forward to the next conference that is in Poznan, Poland next year, with more work to contribute. 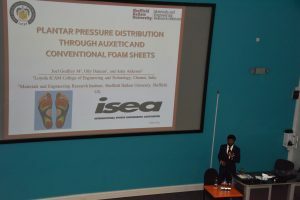 I am approaching the final year of my PhD and as such giving an oral presentation was an excellent opportunity for me to disseminate my work amongst academics and researchers in the wider community. I gained some useful feedback which will feed in to the progression of the study I am currently working on. 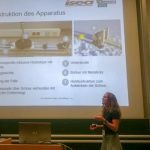 Equally, the conference brought together the ideas and developments of researchers working in various industries across the auxetics community, which helped me to think outside the box about the ways that I currently use auxetic materials in my research. In addition, as my research is based at the Manchester Fashion Institute and many of the other delegates are in engineering, sciences and technical textiles, I found the breaks in the conference particularly useful for generating conversation with researchers in other fields as well as gaining feedback and new ideas. Presenting my work in a professional environment also prompted interest from delegates working in the textile industry, who have discussed the potential of working with myself through the university on a project in the future. In particular, the delegates have offered to share the contacts that they have at sports brands which may be useful for me when I start applying for jobs and looking for opportunities in the sports industry. The student engagement award has enabled me to attend the Auxetics 2018 conference at Sheffield Hallam University and present the work that I have produced over the past two years. 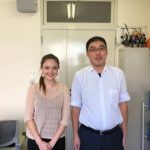 From this experience I have constructive feedback and generated new ideas which will largely help me to shape and progress the final studies of my PhD. The ISEA kindly granted me the full funding of £500, which enabled me to attend the 9th International Conference and the 14th International Workshop on Auxetics and Related System with ‘Negative’ Characteristics. 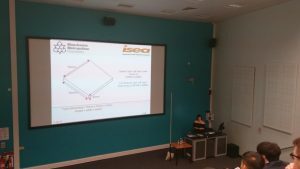 The conference was held at Sheffield Hallam University between the 10th and 13th September and the ISEA funding enabled me to pay the registration/attendance fees, as well as train tickets for the commute between Manchester and Sheffield each day. The conference was well organised with delegates from over 15 countries presenting their work. I was therefore given the opportunity to present my latest findings (and receive valued feedback) to an array of experts from different areas within the auxetics field, which I enjoyed greatly, and it has provided fresh inspiration to continue working hard on my research. The conference also enabled me to network with various delegates who work on similar topics, such as finite element modelling and additive manufacturing. Hopefully, some form of collaboration can arise from this networking. I am looking forward to attending the next auxetics conference in Poznan, Poland, in 2019, where I should be able to deliver some key and final findings from my PhD. Some of the feedback received during the conference has also provided me with some alternative viewpoints on my research, which hopefully I can investigate in more detail in the coming months. Despite living relatively close to Sheffield, I have never had the chance see the city properly. Fortunately, we were taken on a very informative and entertaining walking tour on one of the afternoons and even saw a building whose design looked as it was inspired by auxetic structures. 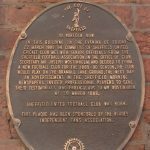 The conference meal at the famous ‘Cutlers Hall’ was also an experience that won’t be forgotten in a hurry. 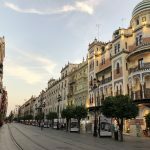 All of this was made possible by the full support of the ISEA and meant that I could completely immerse myself in the experience of an international conference once more – thank you very much. As a master student at the UAS Technikum in Vienna we annually have a measurement week in winter where students can choose topics to work on with own interest. The topic I was working on with some colleges had the title “in-situ tests with touring skins”. Focus of this project was to detect the static and sliding friction coefficient considering different touring skins in the glide and the grip direction of a skin. We had companies sponsoring us with touring skins and supporting our project. 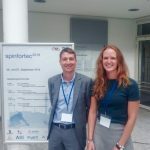 Finally I got accepted at the spinfortec conference in Munich to present our project. 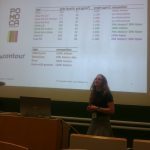 At the congress I had the chance to attend a lot of interesting presentations regarding sports engineering, biomechanics and sport analytics. I am continuously inspired how wide the topic is I am studying for. I met professors from different universities in Germany and had a talk with representatives of different companies who were sponsor of the congress. Presenting my work at the conference allowed me to improve my presenting skills, handle better my nervousness and also broadened my network with people of the sports engineering industry. I had a talk with one of the professors after my presentation and he was really interested and told me about similar studies he undertook. The most important thing about attending conferences is networking! The talks I had have all little relevance to my future career. By supporting my participation of the congress I covered all the costs regarding entrance fee, travel costs as well as accommodation. I also could take part in the “munich evening” where everybody of the conference (lecturers and students) had dinner together at a relaxed atmosphere. Thank you for supporting me! 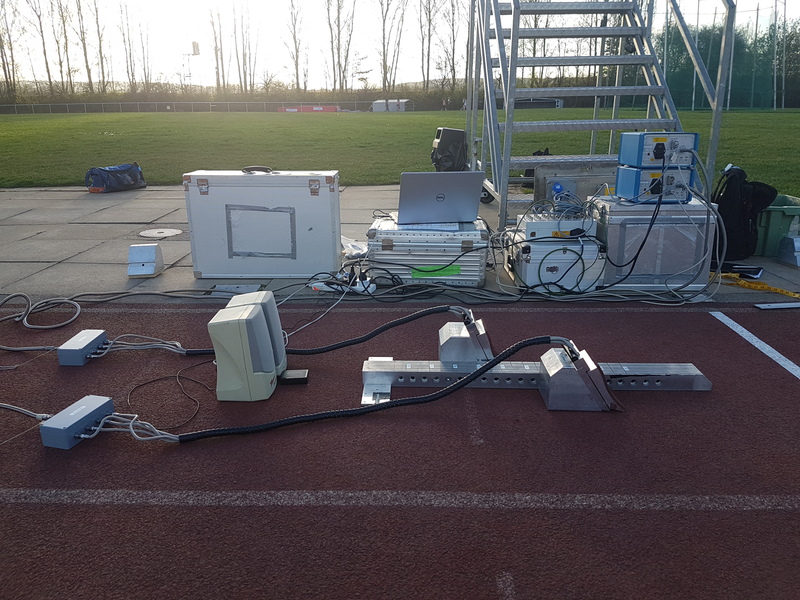 The ISEA student Engagement Award was used to help subsidise my transport and accommodation costs while visiting German Sport University Cologne to loan custom-made instrumented starting blocks and corresponding software to be used for my 1st PhD study. As a result of the trip, a collaboration is emerging with Dr Steffen Willwacher, firstly to investigate the differences between global kinetic (average external block power and ground reaction forces (GRFs) in all three planes of motion) and temporal (contact time in the blocks) variables during the block phase of the sprint start on the bend and the straight. Ten sprinters, all experienced in bend sprinting (200 m PBs ranged 21.40 – 23.20 s), completed three 10 m maximal effort sprints on the straight and three 10 m maximal effort sprints on the bend in lane 1 (radius 36.5 m). 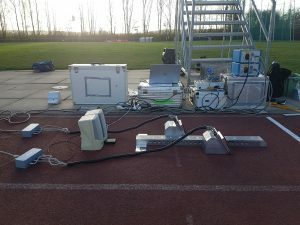 The sprinters all started from the instrumented starting blocks. Results showed that there were no differences in the performance variables including total push time and normalised average horizontal block power. For the front block, external force production in the vertical and resultant forces were significantly different. 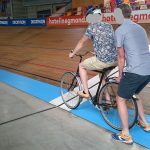 On the bend, the mediolateral forces in both blocks were directed more towards the centre of the track. 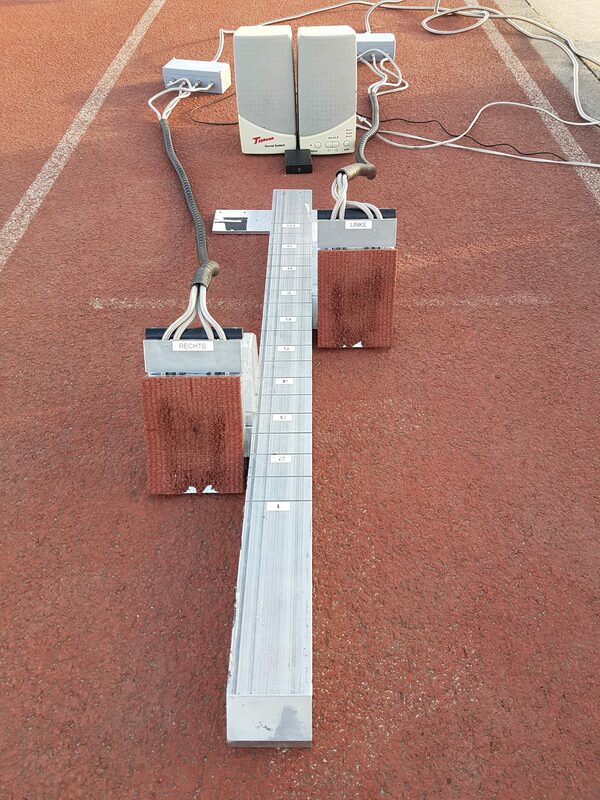 The results demonstrated that in the starting blocks, the bend does not impact on performance variables but technique in applying force changes. The study will be written up with the aim of it being published in the Journal of Sports Sciences. My abstract has also been accepted as a free communication presentation as the BASES Conference 2018 in Harrogate. Dr Steffen Willwacher will be an external member of my PhD supervisory team. 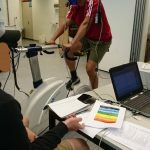 The opportunity to meet with the researchers and engineers at the German Sport University Cologne and discuss how novel sports engineering projects and collaborations might be developed further was a very valuable experience. I was also given the opportunity to speak at a seminar during the visit, a fantastic opportunity for feedback on my work. During the trip, I was shown around the University and their facilities, the starting blocks, the set-up and how to use the equipment. The collaboration with Steffen allowed access to state-of-the-art equipment for data collection, which will advance our understanding of the reasons for performance decreases on the bend, compared with the straight. I would like to thank Steffen Willwacher and the ISEA for the opportunity to visit German Sport University Cologne, borrow the equipment and develop collaboration with an academic who is well published in another country. This has been valuable experience as I look towards completing my PhD.